Assumptions are stupid and dangerous and most of the time wrong! What makes you think I'm a collector? You don't know nothing. Good for you roadster. Great find. Edited 1 time(s). Last edit at 2014-01-04 19:20 by King Bee. I like that LP Special! The red hollowbody, who is the maker? I can't make out the name. Edited 1 time(s). Last edit at 2014-01-25 17:42 by MingSubu. Yes, the LP special is my first guitar With P90`s. And I love it!! A real rockaxe!! The red one is a Vester. One of my first guitars. Sounds great and nice to play. gibsonman, what amps are you running those through? Fenders make great pedal platforms. Get a Vox inspired pedal and rock out!!! I think it sounds close enough, for the government. I'd like to hear it in a band mix. It sounds a bit like the Fuzz Face, doesn't it? Same kind of depth to it. Makes since if you go by the Fuzztone -> Tonebenders -> Fuzz Face lineage. Nothing humble about it. It is a nice guitar. Are you plugged into a Yamaha THR10? There are some nice Squiers out there. 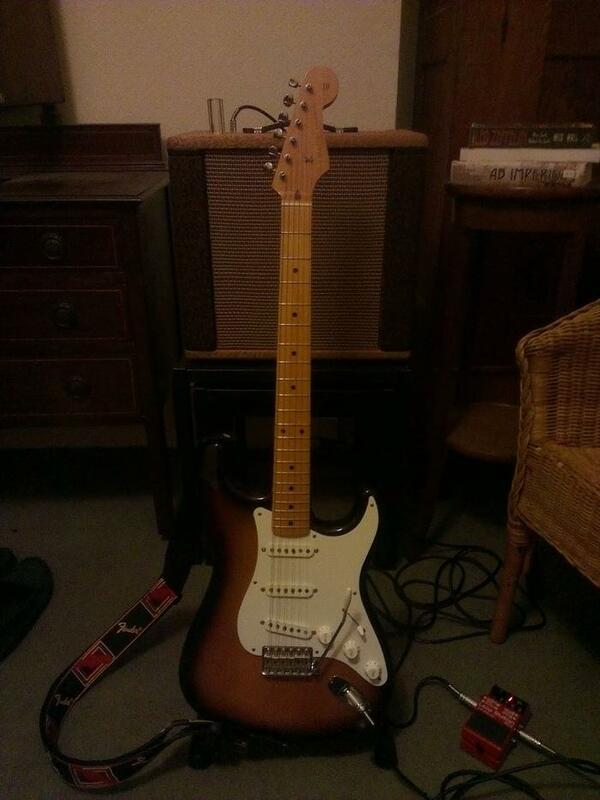 Upgrade the electronics and one could have a decent guitar. Every brand puts out gems/stinkers in each line. Have to play them to get the feel. Atleast in my experience. i am working on the mother of all six strings .should be getting done real soon!!!!!!!!!!!!!!!!!!!!! These are from my phone, with poor lighting, but they'll have to do...the amplifier is a Fender Ramparte, one of the pawn shop ones they bought out last year. Very nice, although the lack of reverb is kind of a drag. Edited 1 time(s). Last edit at 2014-01-30 21:39 by Stoneburst. you all seem well equipped. I myself have 3 el.guitars, 3 accoustic guitars and one occoustic bass. Yeah, it's the THR10C running through Logic Pro, so my possibilities for tone are huge. 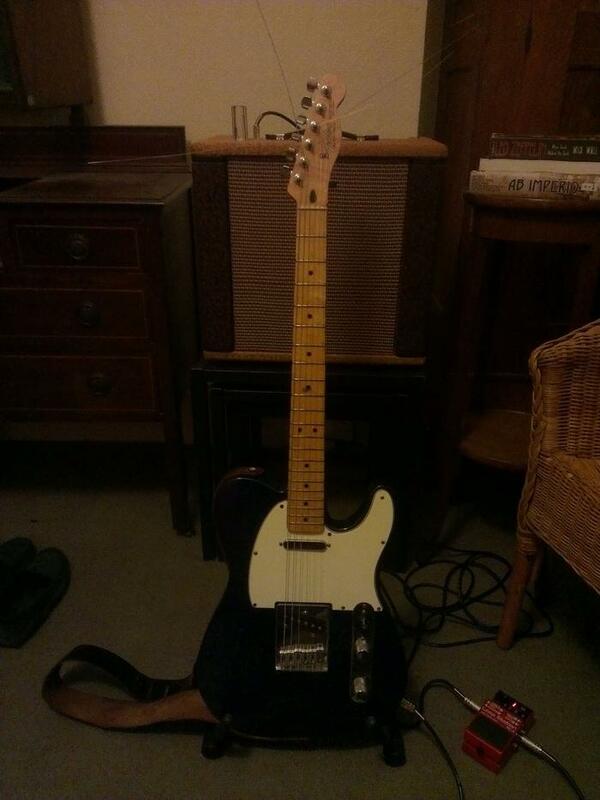 I've been contemplating sticking a humbucker in the neck á la Micawber as the body is already routed, but I'm struggling to find a pickguard routed for one, with 5 screws, rather than the standard 8. Also I thought about setting up a Broadcaster blend pot, but I don't know if it's worth it. This was the best model I could afford at the time, but I've been really pleased with it. By the way: Quite a jewel you've gotten there, Roadster! Edited 1 time(s). Last edit at 2014-02-02 22:45 by audun-eg. Thank you, but these look also pretty cool. Amazing collection. With the exception of the LP Special there's not a single guitar there I haven't lusted after at one point or another. You're a man of wealth and taste, evidently. 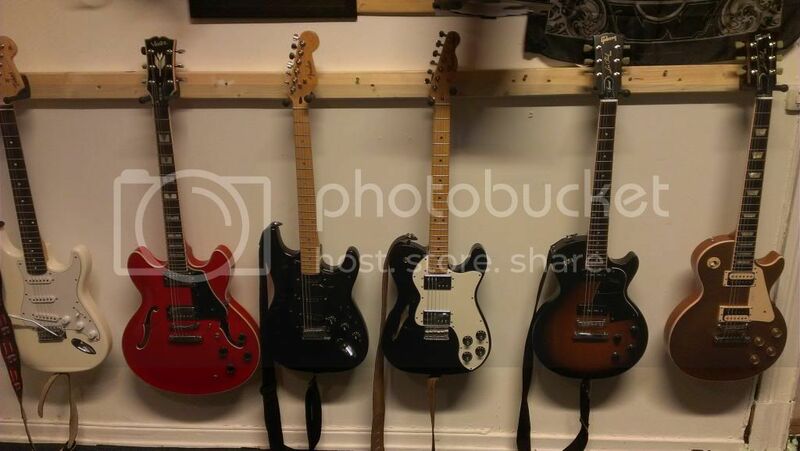 May I ask what the black Telecaster is? It looks a little like the Rosewood Telebration they bought out the other year, but I can't see any grain on it. Is it Jimmy Page-inspired? Another one entered the building. Will get better pics soon.